An entirely non-smoking restaurant. A welcoming place even for families with children. 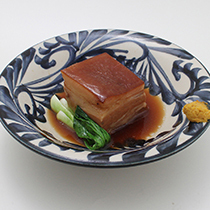 [Run by Awamori Brewery and Helios Distillery] Restaurant of Okinawan cuisine Committed to locally sourced produce as much as possible, Okinawan cuisine made of ingredients selected by the chef himself. As well, all kinds of Awamori produced by Helios Distillery, Okinawan rum, liqueurs such as plum wine, and Helios Brewery's direct delivery / freshly crafted beer are all available for you to enjoy. An entirely non-smoking restaurant. A welcoming place even for families with children. The middle of the international street. The second floor of the building next to JAL City Hotel (with elevator). Please present it at the time of your visit.